Appalachian Mountain Brewery’s We Can So You Can Foundation presents the Curse of Wendigo every Friday and Saturday in October. The event is located at the Horn in the West’s Daniel Boone Amphitheater. There are two events offered: The Kid Friendly Trail/Daniel Boo and the Haunted Trail.The Kid Friendly Trail/Daniel Boo is open from 6:00 p.m.- 7:30 p.m. The Haunted Trail is open from 8:00 p.m.- 11:00 p.m. The Curse of Wendigo’s Shauna Godwin states, “Haunted Horn: Curse of the Wendigo is an immersive haunted trail set in the 18th century. The story follows Joshua, a Colonial Captain, after he makes a horrible mistake that brings a curse upon a small settlement deep in the Appalachian Mountains. Guests will unlock the mysteries behind the curse and find out the fate of Joshua and the settlers as they live out the nightmare. They will journey back in time and choose their path as they wander down dark, desolate pathways if they make it through the settlement of the infected.” The Haunted Horn: Curse of Wendigo is not recommended for those under the age of 13. There will be beer, food trucks and refreshments, along with live music, games and activities for all ages. Tickets are available online or at the event. The Curse of the Wendigo costs $13.00 online and $18.00 at the door. Daniel Boo costs $10.00 for ages 3-17. Parents are free with purchase of child’s ticket. Those who are 2 years old and under receive free admission. Parents may upgrade to the Curse of Wendigo for $10.00. Spectator tickets are available for $10.00. This includes refreshments, and listening to the band. There is no trail access for spectators. 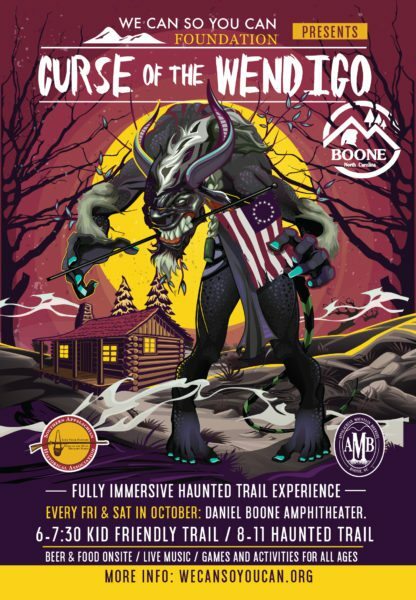 Haunted Horn: Curse of the Wendigo is presented by We Can So You Can Foundation, Appalachian Mountain Brewery, The Southern Appalachian Historical Association, and the Town of Boone. For more information please email [email protected] or view wecansoyoucan.org.